← I’m a Pint-Sized Winner! I love a success story and so I was delighted to hear that Shirley Harber, a member of the writing forum I belong to and long-term supporter of this blog, has just had her children’s novel Krystal Bull Rain Dancer published by Little Devil Books in the USA. I asked Shirley to share with us her route to publication. Tell us about your book’s journey. When did you start writing it and why? How has it changed along the way? I started writing Krystal Bull Rain Dancer five years ago. Back then it had a different title: Krystal Bull Psy-Chick. I remember putting the opening chapter on the web site Youwriteon.com and it got some really great feedback and was quite high up in the ratings. I sent it off to a few publishers but the rejections soon came back, with in most cases the same letter, ‘not suitable for our list’. I then entered the book into a competition,the ‘Are you ready to submit? comp with Cornerstones Literary Agency. It made the final short list of ten out of 1,000. The prize was for it to be sent out to a few publishers but despite some great feedback it was not taken on. I then put it aside and started work on another book, an adventure set in Ancient Egypt. It was time for the Winchester Writers’ Conference again and I had three one-to-ones booked with agents. This is a chance to send opening chapters and synopsis to agents and publishers and then meet with each for fifteen minutes to discuss your work. I decided to send Krystal Bull Psy-Chick to an agent from Nurnberg Agency. During the one-to-one she told me she thought it was a great story but suggested changing one of the characters and also the title. When I got home I gave this some thought and decided what she said made sense so I set about making alterations. How did you hear about Little Devil Books? 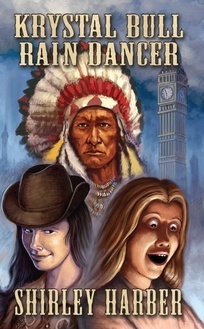 A few months later I was reading Writers’ News and saw that the American publisher ‘Little Devil Books’ was looking for submissions and emailed them the synopsis and opening chapters of my book, now named Krystal Bull Rain Dancer. A few weeks later Amy the editor emailed back to say she was interested and to send the whole MS. A week later I was offered a contract! I had to pinch myself several times! Tell us about the editing process. Amy said she would like to change a few words and phrases so that it also fitted in with the American market, but essentially she wanted to keep the British feel of the book – it is set in London. We worked very closely together, emails going back and forth. She listened carefully to my input and nothing was changed if I was not happy. I had never worked with an editor before and wonder if they are all as easy to work with as Amy. More importantly she loved Krystal and understood her humour. You’ve had a lot of success with your poetry. How does being a poet affect the way you write your prose? Yes, I also write poetry and have won a few poetry competitions and had work published. I write poetry for adults mainly and for me that is separate to my writing for children. One week I might wear my poetry hat another my writing for children hat! What are your plans now? Is there a follow-up to Krystal? At the moment I am writing a sequel to Krystal Bull Rain Dancer with some new spirit guide characters, both good and evil, and Krystal will no doubt be performing her rain dance again. What advice would you give to writers who are starting out on their journey to publication? Don’t be disheartened by rejections. All writers get them. Think carefully about any advice given on letters of rejection (or from agents etc) but go with what you feel is right. Try and go to Winchester Conference and meet agents personally to discuss your books. I wish I had done that when I first started writing. The advice I have had there has been invaluable, not just for this book but for others I have written and also for my poetry. Try and find some writing buddies. Join an online forum such as Writing Magazine’s Talkback. Writing buddies can give you advice and support you through the lows and highs of this writing business. Enter as many competitions as you can. If you get a placed it is a real confidence boost to your writing and they help hone your writing skills. Try and attend a writing school where you can attend writing workshops to improve your skills and meet like-minded people. I have attended The Swanwick Writing School in Derbyshire twice and made some great writing friends there. Winchester Writers’ Conference as mentioned is another. If you believe in your story then keep sending it out to agents and publishers. One day you will find someone else who also believes in it as I did with Krystal Bull Rain Dancer. Some really useful advice there from Shirley and a good example of how a book can change and grow and even pass through a number of people’s hands before it finds a home – in other words, persistence is definitely the key to success! Krystal Bull Rain Dancer is available on Amazon in paperback and as an ebook. You can find out more about Shirley Harber and her writing at www.shirleyharber.com. This entry was posted in interviews, success stories and tagged Krystal Bull Rain Dancer, Little Devil Books, Shirley Harber. Bookmark the permalink. Great to hear a success story and thanks for sharing your advice as well! Congratulations Shirley! Pingback: www.shirleyharber.com » Writers Links. Congratulations from me too, Shirley.